Does this product require a perscription from a vet? No, we do not require prescription. I love Revolution but I need tapeworm coverage too. Can I add Profender or Drontal? What country does this ship from? Each tube provides protection for 1 month for each cat and This product has 6 tubes so it covers 2 months of cover for your 3 cats. This is a simple review, this product protects against fleas and much more, it's simple to use and it works! Excellent job. Great product. Exceptional customer support at a wonderfully reduced price. Will definitely use over and over again! Great product always arrives on time!!! 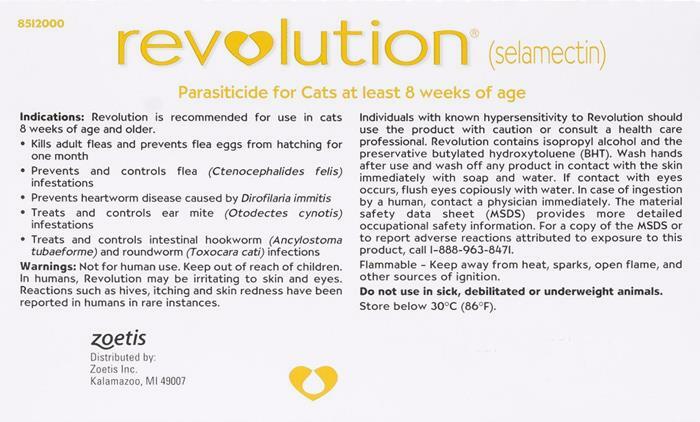 This is the same thing as Revolution sold at veterinarian’s office for twice the price. It is great for my out door cats. They are free of fleas, ticks, and stay very healthy.